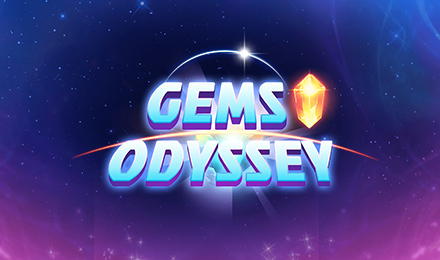 At Moon Games, you can win top prizes by levelling up on Gems Odyssey slots. Consisting of a RTP of 94.50%, this arcade game comes with huge chances of winning. Plunge into ancient history at Moon Games by rolling the reels of Gems Odyssey slots. On the reels of this game, you will find one of the most precious gems, the Nebula. Created by Skillzzgaming, this game consists of a 5x5 grid. The gameplay is simple- you need to match 3 identical symbols, so that the unrevealed gems are shown. Be prepared to travel across galaxies while you play this game. You better watch out and match the similar tiles, so that the best wins come your way. Win bigger and better as you reach different worlds.